Our pure and natural body wash is different from most other liquid shower products on the market because we use real soap (instead of harsh detergents), hand blended from certified organic olive, coconut and castor oils, with organic botanical extracts and lightly scented with pure, steam-distilled essential oils for a gentle, silky lather that doesn't dry your skin or make you feel itchy--only soft, refreshed and clean. 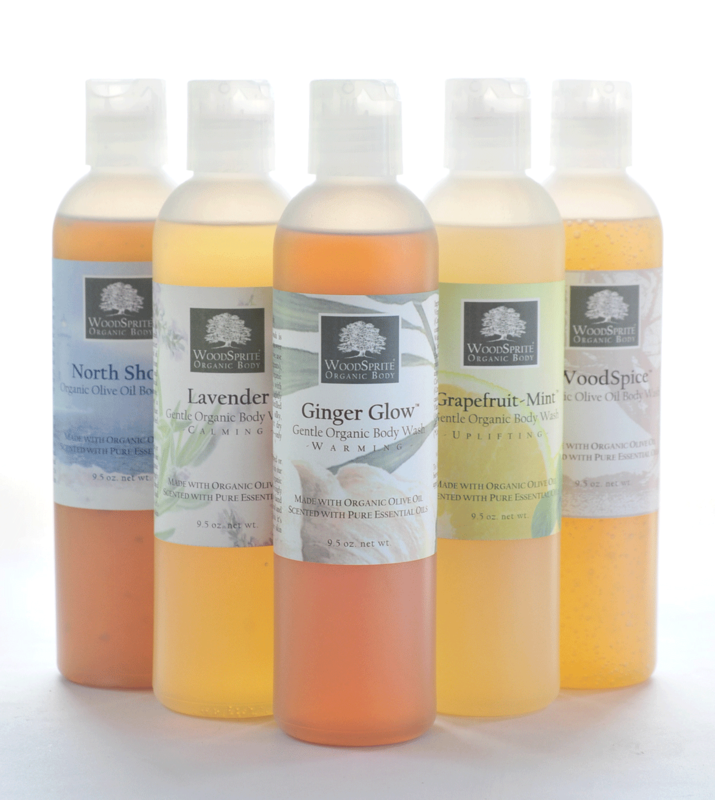 TIP: Our body washes make a fantastic gentle hand soap, as well! For convenient one-handed dispensing sinkside or in the shower, you may add an optional recyclable plastic pump here. You'll never find petroleum-derived, synthetic chemicals or fragrances in any of our products. Every single WoodSprite Organic Body product is proudly and lovingly handmade entirely from scratch using only the purest natural and whole ingredients, in as complete its natural form as possible. We simply think it's better that way--better for our skin and better for our planet. Ingredients: Saponified Oils of *Extra Virgin Olive, *Coconut & *Castor, Purified Artesian Spring Water, *Organic Vegetable Glycerin, *Guar Gum, Select Pure Essential Oils; Fresh Extracts of *Lavender, *Green Tea, *Marshmallow Root, *Oat Seed and *Calendula; Vitamin C. (*Certified Organic) 100% Natural. 8.5 fl. oz.